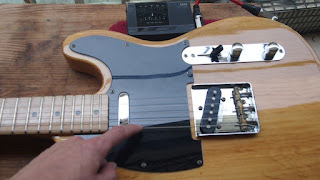 Today I’m going to show you how to set up a Fender Telecaster-style guitar. 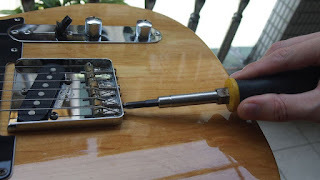 We are only going to do a basic setup, which is enough most of the time, but occasionally more is required, such as filing the nut, or doing some fretwork. Since we only want to check how straight the neck is, we need to isolate this aspect of the guitar. In other words we don’t want the height of the nut or the placement of the saddles to confuse us, so we take them out of the equation. Don’t worry; we’re not going to remove any of these components, just circumvent them. I use a ruler to do this, but you can do it using only strings. I’ll describe both methods below. 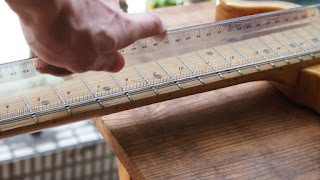 Get a ruler (or straightedge if you want to be all fancy) that is at least as long as the neck, but not so long that it reaches all the way from the nut to the saddles. If you can’t get one between these lengths, and are willing to sacrifice a ruler, get one that’s too long and cut it to length. Alternatively, you can just cut a little out of one edge so that you can still make full use of the other edge of the ruler. 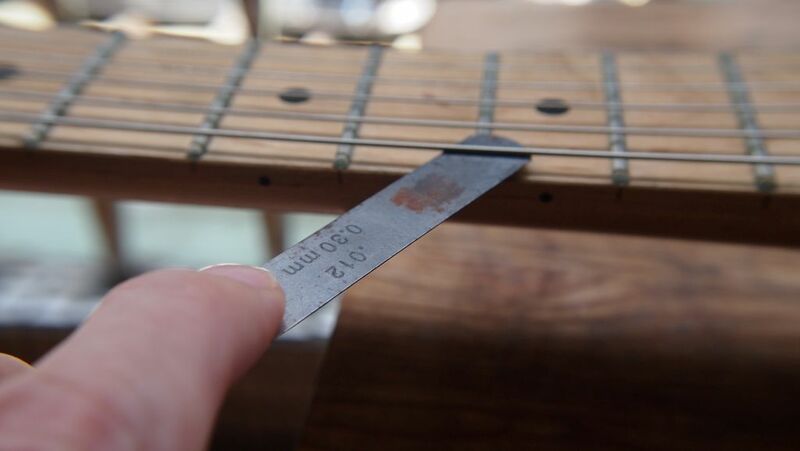 Now lay the edge of the ruler along the frets (don’t rest it on top of the nut or the saddles). If the gap is perfect, congratulations – you may now move on to step 2. If the gap is too large, then you need to tighten the truss rod a little (similarly, if the gap is too small, you need to loosen the truss rod). Locate the adjustable end of the truss rod. 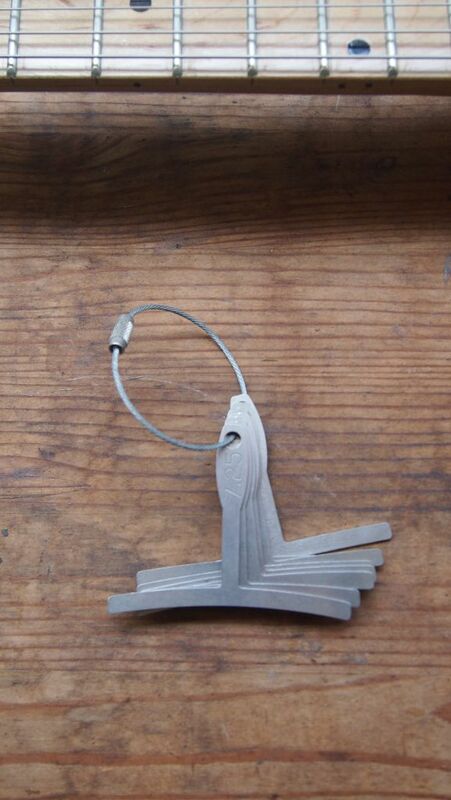 On this guitar it is at the head of the guitar and requires a 4 mm Allen key, though your guitar may be different. 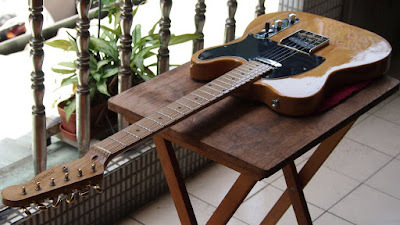 On some Teles, it is located at the other end of the neck. 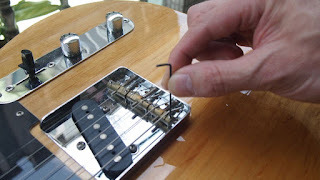 This is a pain, because every time you want to make an adjustment to the truss rod, you will need to loosen the strings, remove (or partially remove) the neck, adjust the truss rod, re-attach the neck and tighten up the strings again to check the neck bow. 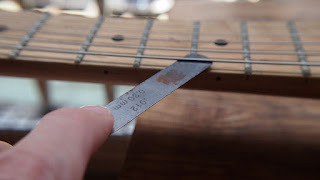 Anyway, here’s how you adjust the truss rod. This must be done with the strings tuned to whatever pitch you usually use. If your neck is too bowed (the gap you just measured is too big), you tighten the truss rod by turning the Allen key (Allen wrench), screwdriver, or socket (the tool required depends on your guitar) clockwise. It is recommended that you only turn the tool a quarter turn (or even an eighth turn) at a time and then give the neck some time to settle. 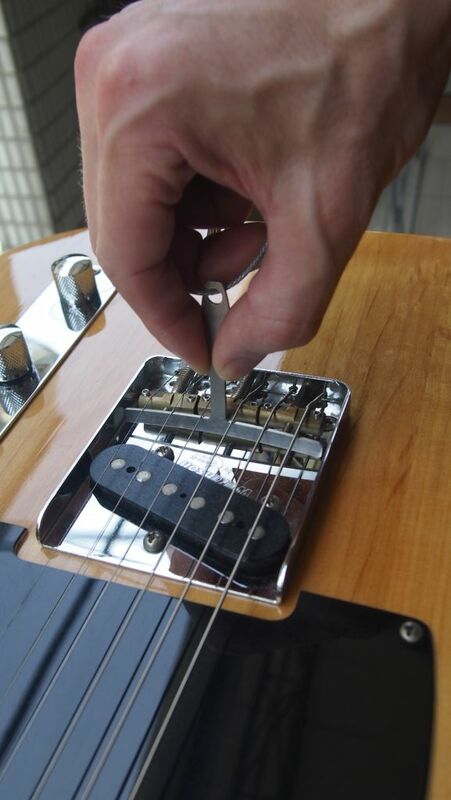 You will also need to make sure the strings are still properly tuned after each adjustment. CAUTION: If you find that the truss rod is very difficult to turn, then stop now and take your guitar to the guitar shop. It may be that there is a problem with the neck or the truss rod and you may damage the guitar by forcing it. Believe me, you do not want to damage the truss rod. If, instead of tightening the truss rod, you need to loosen it, do so by turning it anti-clockwise (counter-clockwise). Again, a quarter turn at a time. Once you have got the gap to 0.012” (or whatever gap you prefer), you will have finished this step. Feel free to remove the capo at this stage if it is attached. 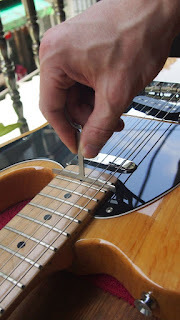 Firstly check and, if necessary, adjust the low (thick) E string height. 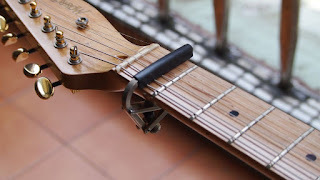 Do this by adjusting the height of the saddle on the bridge (on this guitar, a 1.5 mm Allen key is required, though your guitar may require something else). Then this is done by screwing the outermost screw in or out. Since Telecaster’s generally have three saddles (each supporting two strings), rather than six individual ones, you will probably end up with them being at a bit of an angle, rather than parallel to the guitar. This is fine (if you happen to have six individual saddles, then for each one, I recommend that you try to keep the two screws at the same height as each other, although some people would disagree with me). The question here is how high to make the saddle. Well, this is personal choice. Find somewhere were the string doesn’t buzz on any fret from being too low, but low enough that you can play up and down the neck easily. There’s usually a sweet spot where you can just start to detect some buzzing and you can leave it just a tiny bit higher than that. Now do the exact same procedure for the high (thin) E string. There are two ways that you can go about adjusting the other strings. Method one: Adjust each string the same way as you just adjusted the two E strings. Incidentally, I use these snazzy radius gauges that can go either above or below the strings (below gives a slightly more accurate result, although the difference is arguable). Please don’t take these measurements as the absolute final string height, but more as a good estimate. You can adjust them a little to your own personal tastes after this. OK, that’s step 2 finished. Your guitar should be nice and playable now. However, it may not seem to stay in tune very well. That’s because the intonation might be off. The intonation here refers to the forward/backward position of the individual string saddles. 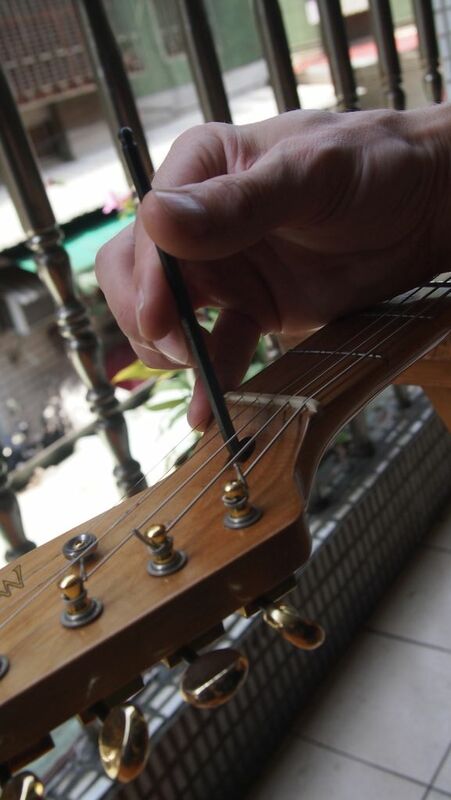 By moving the saddles forwards or backwards, we are actually adjusting the length of the strings. Without going into too much detail, if the string is the wrong length, the positions of the frets will not be correct and the guitar will be out of tune on some of them. 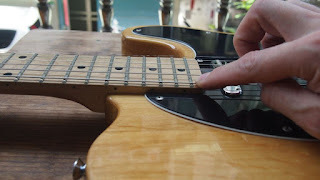 Adjusting the intonation is not difficult. All you need is a guitar tuner and a tool to move the saddles forwards or backwards. Play an open low E string and make sure it is in tune (using the guitar tuner). Now play the 12th fret of the low E string. It should also be in tune. If it is too high, then you need to move the saddle back. This increases the length of the string. If the note is too low, then you need to move the saddle forwards. This decreases the length of the string. Now check both the open and the 12th fret notes again. You’ll have to tune the open string again because by moving the saddle, the tension of the string will have changed and so will need to be retuned. Once you have correctly moved the saddle so that both the open string and the 12th fret are in tune, you can move on to the A string. Ordinarily, you would repeat this step until all of the strings have been done. However, if you have three saddles rather than six, you may have to compromise a little and find the position where the pair of strings passing over each saddle are as well intonated as possible. One may end up being a mm too short and the other a mm too long. You will notice that I use “staggered” saddles on this particular Tele. They help minimize the compromise you will have to make, and if you’re lucky you’ll end up with something close to perfect. That’s a basic setup done. Hopefully your guitar will now be easy to play and appear to be in tune no matter where you play the note.